Usually my bad karma manifests itself as a star chip in a windshield or a slipping clutch but lately it’s been all about the waterpump. When I had the engine out of the Berlina I noticed a lot of play in the waterpump pulley but I thought that since the engine had worked so good for so long in the Sprint, I’d just roll with it. These things can take decades to tear themselves apart I thought. Last week when I went to the local Mexican market a few blocks from my shop for some Tecate, chips and salsa and pineapple Fanta to restock the shop ‘fridge, I came out of the store and there was a puddle of pretty green antifreeze under my car. So much for a slow decline for the water pump. Is it just me or is coolant more viscous than it used to be? All this was apart a few weeks ago so since it’s fresh in my mind I suspect I can get through it pretty quick. I popped the hood at 5:30pm after picking up a set of sparkplugs, some carb cleaner and some ultra gray from my neighborhood chain auto parts store. I had a date to keep at 7:30pm so I had to hurry. Berlina project part 3: success! My dad was in town and to keep him busy I brought him to the shop with me on Saturday afternoon a couple of weeks ago. We spent most of the time talking about the best approach and after one false start got the engine and transmission to mate up. Not an easy job when you leave the transmission in the car. Dropping the front swaybar turned out to be the trick to make two faces parallel. Once it was in I probably spent more time trying to find the correct bolts to bolt the motor mounts down than I did installing the engine. Two successive afternoons the following week I put all the pieces together and to my amazement it fired right up. I didn’t want to try and retrofit the early 60’s 1600 Veloce airbox (though it probably would have looked very cool) so I traded it for the Euro airbox seen here. I spent $11 more than I paid for the car on a bag of parts from a local dealer including a new oil pressure send unit to put the finishing touches on the assembly part of the project. Here it is in all its glory. I traded a late ‘scalloped with tabs’ valve cover for the smooth unit seen here with the 90 degree breather to match the airbox. Note the high out-put alternator from a late 80’s spider. I don’t know if I should start this by saying I’m ahead or behind. I thought it would take me a few weeks to get the 1750 out of the Sprint and into the Berlina, but I guess I thought wrong. I will admit that taking a full time job, hosting my dad for a week, going out of town for most of the weekends between buying this car and my birthday a few weeks ago and other everyday life interruptions have played a part in retarding my progress, but I’ll also say hey, it is coming along. I’m in no danger of selling this thing on eBay in 20 years after cowering in the corner of procrastination. To the point. Once I got the engine out of the Sprint it required a bunch of parts change over to prepare it for its new life in the Berlina. The biggest job was swapping the oil pan and pump. The second biggest job was cleaning it up after leaking around the rear main seal and valve cover gasket heavily over the last 20,000 miles in the Sprint. I had never replaced an Alfa oil pump before this. 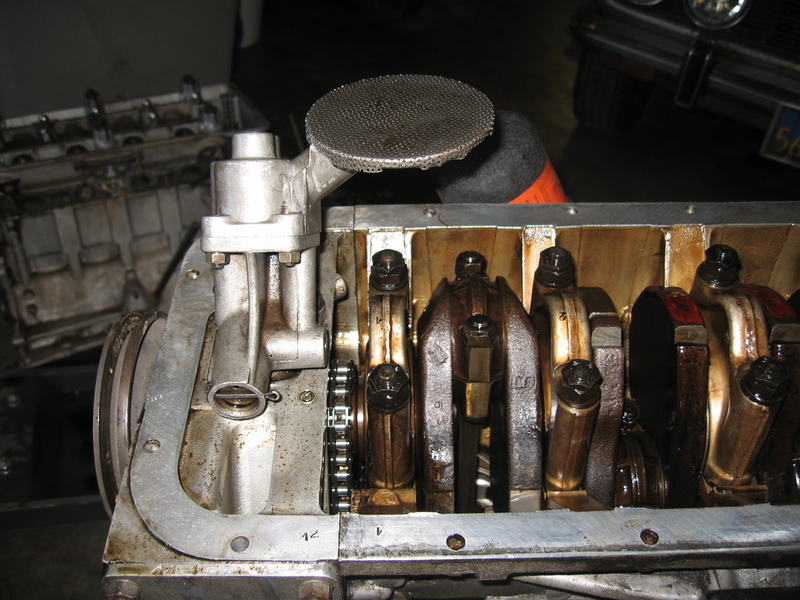 The bull-nose or whatever you want to call it oil pan requires a specific oil pump. That’s the 1300 in the background that is going in the Sprint when all this Berlina hootenany is done. 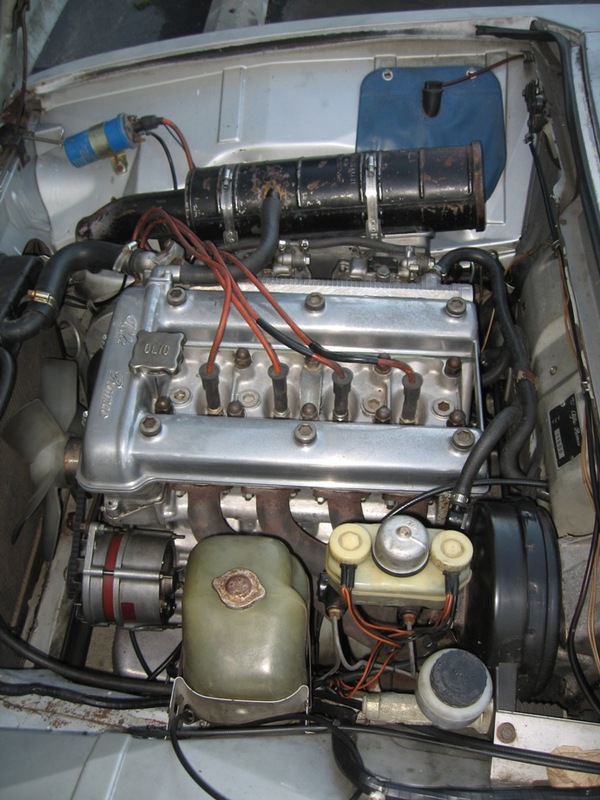 Sprint to Berlina engine swap advances: Part 1 of Sprint engine rebuild and Berlina revival. After I picked up the new windshield for the Berlina in Berkeley I headed down to the shop to finish the pulling portion of the job. I am new to pulling and dropping in engines so I probably spent way too much time thinking about it compared to just doing it. I decided to pull the transmission from below due to the tight fit of the 1750 in the Sprint, which turned out to be a good idea, though difficult. To pull the transmission the tunnel opening cover has to be removed along with both shift boots (and a whole bunch of stuff on the underside). It took about an hour to get the right angle and grip on it but eventually the trans slid free of the main shaft. I put a tire under it so if it got loose unexpectedly it wouldn’t hurt itself crashing on the cement floor. I hated pulling up the nicely glued in carpet but there was no getting around it. The cover had two Philips and two slotted screws, nice touch. 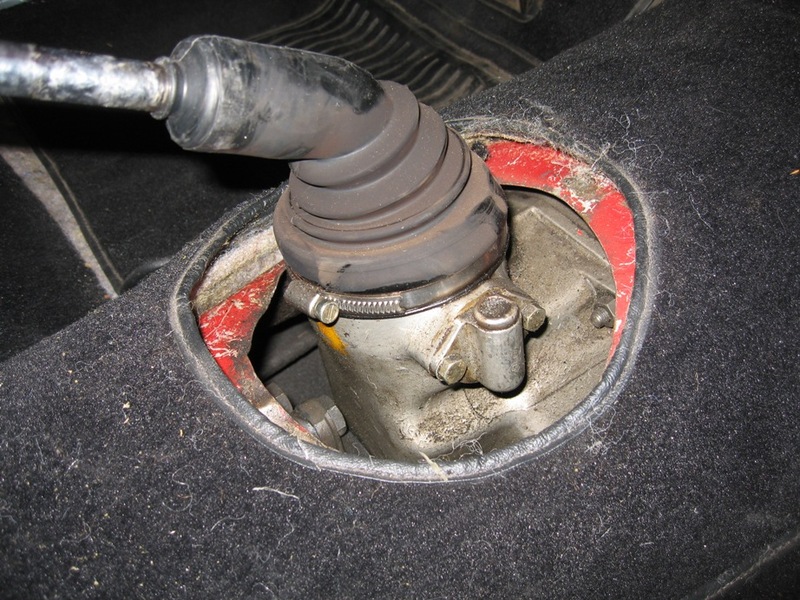 The boot you see here is what keeps you from smelling gear oil when you drive. Stinky stuff. I’ve been thinking about what I want out of the Berlina and how best to achieve it. I want a daily commuter that gets as close to 30mpg as possible with plenty of torque and top end. I have been pondering the quickest, cheapest and easiest approach to getting this out of the Berlina and I think I figured it out yesterday after an hour long session going back and forth between a catalog and an Excel spreadsheet followed by a call to my local used Alfa parts supplier. I’m going to pull the carburetted 1750 that is in my 1959 Sprint out and put it in the Berlina then put the original 1300 back in the Sprint. What a mess! 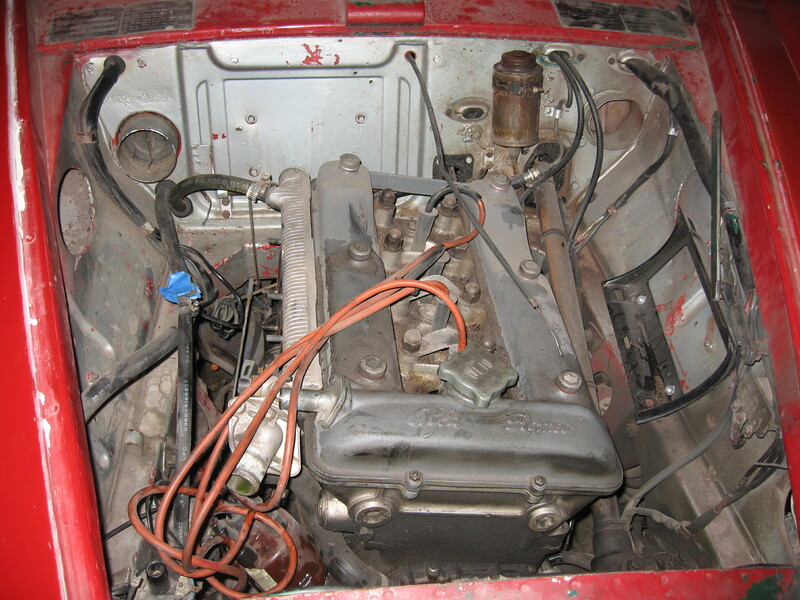 You can see from this picture why I was keen to freshen up the engine bay on the Sprint. An hour of work and I’m ready to crawl under the car to disconnect the transmission.